Remember when Urkel did “The Urkel?” Classic. Man, living in the 90s was so much better. You could just tell some random guy to “crank it” and all of a sudden you had music that you could instantly make up a dance to that somehow everyone around you would automatically know how to do even though you just made it up on the spot. But sometimes not everyone is happy with your instantly amazing dance and they need to spike the punch and get you drunk as an act of revenge (as is customary at most 90s parties). Sadly, this happened here. It seems William couldn’t take Urkel’s dance moves so he spiked his punch and got him drunk to the point that he fell off the side of a building. 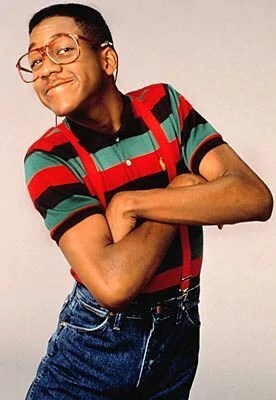 Thankfully (maybe) Urkel didn’t die. But this act of punch spiking was just the beginning of a life of crime for young William as years later he would grow up to be a criminal who stole cars with Ludacris in the movie Crash. He is eventually shot and killed in that movie by Ryan Phillippe. So let that be a lesson to all you punch spikers out there. While you may think you are just having fun, it is a slippery slope and eventually a devastatingly handsome off-duty police officer will offer you a ride and proceed to shoot you dead. Is that what you want? I thought so.